Microsoft on Monday outlined a few changes that are coming in Windows Phone 8 Update 3, known internally as "GDR3" or "general distribution release 3." The rollout for Update 3 "initially kicks off in the coming weeks and will continue over several months," according to a post on Microsoft's Windows Phone Blog attributed to Darren Laybourn, corporate vice president of Windows Phone. As with past Windows Phone 8 updates, the timing of when users actually receive Update 3 will depend on the model of their devices and their carriers. Windows Phone 8's last update, GDR2, rolled out to users this past summer. 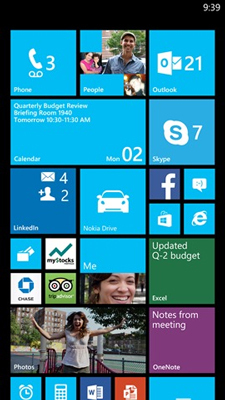 Windows Phone 8 Update 3 enables a wider Start screen.